PLO Secretary-General rejects Netanyahu and Liberman’s statement in favor of peace talks and the two-state solution. 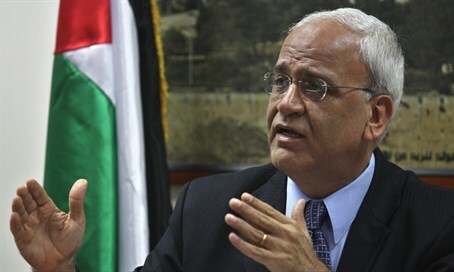 PLO Secretary-General Saeb Erekat on Tuesday rejected Prime Minister Binyamin Netanyahu and Defense Minister Avigdor Liberman’s statement in favor of peace talks and the two-state solution. Erekat said that the realization of the two-state solution requires an explicit and clear recognition of the pre-1967 borders by Israel, the WAFA news agency reported. “We are used to Netanyahu and his government's inconsistencies and contradictions between words and actions," Erekat charged, according to WAFA. Erekat also warned against taking the Arab initiative out of context and stressed that the Palestinian position toward the Arab initiative is defined and clear. "This is a critical juncture in our history and we hope that the international community commits to ending the injustices committed against Palestine by recognizing the importance of such pursuits as the Arab Peace Initiative and upcoming French conference within a defined framework and timeline, guided by international law and UN principles," he added. The Saudi peace initiative, unveiled in 2002 and re-endorsed at the 2007 Arab League summit, says that 22 Arab countries will normalize ties with Israel in return for an Israeli withdrawal from Judea and Samaria. Israel to date has rejected the plan due to the fact that it calls for Israel to accept the so-called "right of return" for millions of descendants of Arabs who fled pre-state Israel, effectively bringing an end to the Jewish state. Recent reports, however, have indicated that Arab countries, including Saudi Arabia, the Gulf states, Jordan and Egypt, are prepared to discuss with Israel changes to the Saudi peace initiative in order to resume peace talks between Israel and the PA.